Kotagiri is in Nilgiri district situated at an elevation of around 1793 m above sea level and is one of the three popular hill stations in Nilgiris. 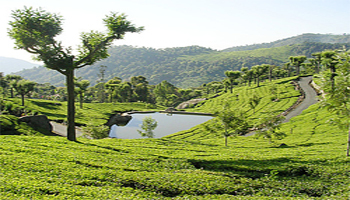 This picturesque hill station is bounded by verdant green tea estates and offers a number of trekking options. Dodda Betta Range is 22 km away. Catherine Falls, Elk Falls, Rangaswami Pillar are the major attractions near this place and you can trek to these places. Kodanad View Point offers a spectacular view of the gentle sloping hills and blue hills. There is another jungle trekking trail that leads you to a small stream of water. Kotagiri, although having no written history of the pre-British period, has been around for eons possibly. The area just below Coonoor and the slopes of the Nilgiri hills has been the traditional home of the "kota" tribes. The name ‘Kota-giri’ itself means ‘mountain of the kotas’. While the todas are the traditional agriculturists of the Nilgiris, the kotas are the traditional artisans and are experts in the art of pottery and terracotta baking. The ‘Kota’ tribe is known for their reclusiveness and their reluctance to meet or mix with any outsider. They currently number just around a 1000 members, and are fast declining.The Kotas worship at this temple every month and the annual festival which takes place on the “Arudra Dharshan” day at this temple is of great importance to all the Kotas of the district. Kotagiri is linked by road to Mettupalayam. The road which continues on to Ooty (27 km from Kotagiri to Ooty) is one of the Nilgiri Ghat Roads and is now one of the five access routes for the entire district. Coonoor is 23 km from Kotagiri and connected by a road that branches off the Ooty road. Buses to Kotagairi are available from Mettupalayam in the foothills and also from Ooty and other places. Kotagiri is well-connected with all the major cities of Tamil Nadu by road. There are regular bus services from Ooty, Mettupalayam and Coonoor. The nearest railhead is in Coonoor. The nearest airport is in Coimbatore (105 km) which is well-linked to cities like Chennai, Bangalore and Cochin.